The Recovery Bill of Rights originally drafted in 2013 is a statement of the principle that all Americans have a right to recover from addiction to alcohol and other drugs. We called on all Americans and our elected officials to take action to build communities of recovery that will support the more than 23 million Americans and their families still needing help and to end discrimination facing the over 23 million Americans in long-term recovery. Today, in 2017, Faces & Voices of Recovery recognizes the need to revisit and update these Rights to better address the empower individuals and families seeking understanding of the recovery support services process. In order to do such we have invited recovery and family advocate leaders from across the country to the Recovery Rights Council. 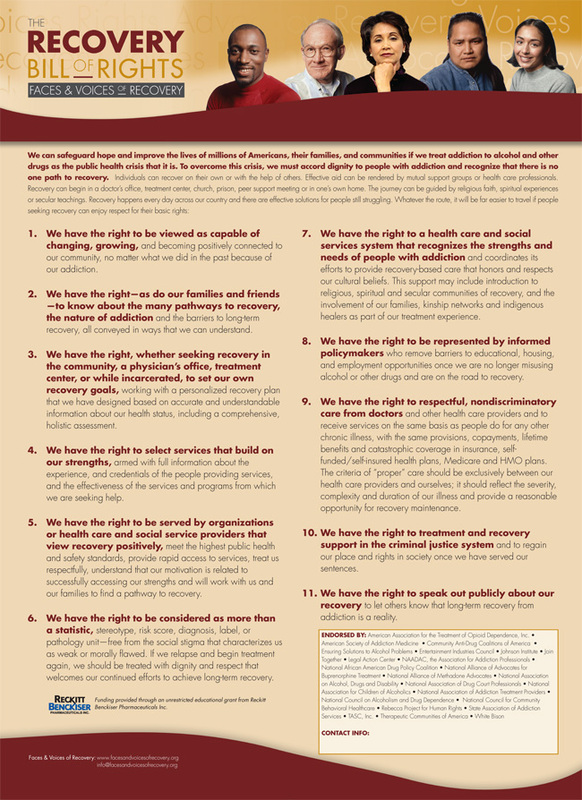 The Recovery Rights Council will be responsible for updating the Faces & Voices of Recovery Bill of Rights. This will consist of researching evidence based practices, human rights laws and other resources to add into the existing Bill of Rights to meet the current state of the Recovery landscape. Already identified topics include; Treatment Trafficking, Fair Housing, Criminal Justice Advocates and more. Drafts will be then distributed to Recovery Community Organizations and other supports to allow for peer participation and public input. We are aiming for an official Jan 2018 release date with several media release events with partners and organizations across the country. Faces & Voices of Recovery, located in Washington, D.C., is organizing the over 23 million Americans in recovery from addiction to alcohol and other drugs, their families, friends and allies in a campaign to end discrimination; broaden social understanding; and achieve a just response to addiction as a public health crisis. For more information, visit www.facesandvoicesofrecovery.org.